Lauren Payne from Anjali Dance Company launched the programme for the forthcoming Together! 2017 Disability History Month Festival on Monday 23 October with the world premiere of her debut solo Unicorn. Lauren is the youngest member of Anjali, currently touring internationally with their double bill Genius, and also dances with Young Anjali. Her performance also took place as part of Newham Heritage Week. As a professional dancer with learning difficulties, Lauren is still a pioneer. After gaining her GCSE in Dance, Lauren studied at Greenwich Dance Academy. She took part in Sky TV’s ‘Got to Dance’, and has performed at Sadler’s Wells and Trinity Laban. Lauren also studied at Trinity Laban Conservatoire of Music and Dance, where she gained the Young Dance Ambassadors Silver Arts award. Lauren has been working with Anjali since 2014, and when not on tour she commutes from her home in south-east London to spend three days a week in Oxfordshire rehearsing with the company, arriving at 9am every Monday morning to begin work. For her first solo with Anjali, Unicorn, Lauren worked with company choreographer Aya Kobayashi, composer Nicolette Macleod and designer April Dalton. Lauren explained at the Together! 2017 Disability History Month Festival launch event that she has always been fascinated by unicorns, and was able to gather a mass of research material, including poetry and images, before beginning the choreographic process. Later, Lauren and Aya were able to provide Nicolette with images and colours to inform the composition, which combines sounds from nature with other ambient noises including, rather surprisingly, a scanner. In Unicorn, Lauren embodied the strength and purity of this mythical creature, alone in the wilderness, listening to birdsong and absorbing the sunlight. Her horn, created with her hair, led the way. This was not a sculptural piece in the sense that there was always movement, however minimal, but the shapes that Lauren created with her body as she danced were pure art. 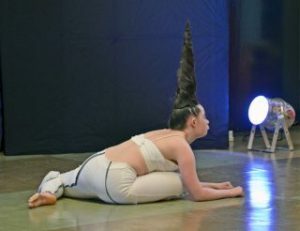 If disabled people are going to be described as animals, then Lauren turned this around and portrayed the rarest, most unique and beautiful, with a powerful and moving performance that was other-worldly. I was delighted to be able to launch our festival with the first professional solo performance by a young dancer, and particularly with the world premiere of such an impressive work. I have long been a fan of Anjali, and they continue to go from strength to strength. Director Nicole Thomson’s approach has always to bring together the cream of mainstream choreographers to work with dancers with learning difficulties, taking full amount of different physicalities rather than choreographing for the average body. 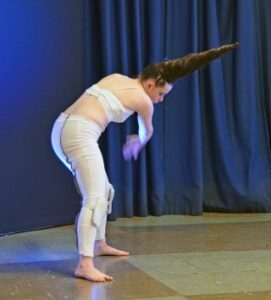 Lauren Payne performing the world premiere of her solo Unicorn at our festival launch event on 23 October 2017. Locally-based artists also benefited from a morning workshop led by Lauren and Aya, where participants were able to learn some of their techniques for making work. The Together! Dance Club began last September 2016, and meets on the fourth Monday of each month from 11am-1pm (arrive from 10.30am). The Club focuses on making dance for the screen, with members also deciding to perform masked. See http://www.together2012.org.uk/activities-programme/together-clubs/dance-club/ for further details. Unicorn is just the start of the performances, exhibitions, screenings and workshops taking place during the Together! 2017 Disability History Month Festival, opening on Friday 17 November with the launch of gobscure’s visual poetry exhibition prisong and an accompanying performance by Newcastle-based artist Sean Burn. In association with Newham Word Festival. FREE. All welcome.